America is embarking on a new way of war in Afghanistan and elsewhere in which battlefield restraint, cultural subtleties, and armed nation-building enterprises matter more than destruction of the enemy. These innovations represent a doctrinal break from how the United States waged war in its most heroic chapters. The new doctrine relies heavily on the use of indigenous surrogate troops, the goodwill of the local people, societal reconstruction, and the host government’s legitimacy, policies, and conduct. These underpinnings of the indirect approach, it must be emphasized, often lie beyond Washington’s complete control or even limited influence. By working through—and being greatly reliant on—the agency of others, the recently evolved American strategy strives to defeat insurgencies and to deny terrorists havens from which to launch attacks against the American people and their interests. Even exponents of the indirect approach acknowledge that the strategy can never eliminate the need for the United States to ensure its own defense. Yet America cannot intervene directly into every ungoverned space to eliminate terrorist nests. Direct expeditionary intervention with a large conventional military footprint, accompanied by high-cost state-building undertakings, would lead to America’s exhaustion and insolvency. The costs in blood, treasure, and moral authority would be too steep. French soldiers, part of a NATO multinational force, fire a mortar in Afghanistan last September. The classic view of war called for force-on-force application of massive violence and the utter defeat of the enemy on a battlefield. The new way of war in Afghanistan focuses instead on battlefield restraint, cultural subtleties, and nation building. Faced with an expanding list of undergoverned spaces in dysfunctional states around the globe beckoning to local extremist cells or Al-Qaeda-franchised terrorists, the United States urgently needs an effective and reasonably inexpensive strategy. The current version of the indirect approach borrows heavily from the revamped counterinsurgency (COIN) strategy of the U.S. Army and Marine Corps. Local armies and police are trained in current U.S. population-centric techniques of conducting COIN operations as they partner with American regular units and Special Operations Forces (SOF). Although the indirect approach has many pluses, it demands substantial societal transformation, massive financial expenditures, and Western-oriented governments to serve as hosts for nation-building efforts. These requirements spawn troubling caveats and concerns about fighting through the medium of a transfigured political landscape. America cannot intervene directly into every ungoverned space to eliminate terrorist nests. The costs in blood, treasure, and moral authority would be too steep. As Napoleon remarked: “War is a simple art, all a matter of execution.” The United States has tried indirect campaigns in the past, and I have studied the shortcomings and miscalculations of those campaigns to help hone the art of indirectly combating insurgent-based terrorism. How those campaigns were executed, and their implications for our current operations, are treated in full in my recent monograph Afghanistan, Counterinsurgency, and the Indirect Approach (Joint Special Operations University, 2010). The new way of war deserves to be treated with a note of caution. The new version of the indirect approach owes its rebirth to the “surge” tactics employed in the spectacular turnaround in the Iraq War starting in early 2007. To calm the raging Iraqi insurgency, the United States military liberally paid, equipped, protected, and guided Sunni tribal militias, which broke with the Al-Qaeda movement in Iraq because of its near-indiscriminate violence and imposition of draconian religious practices. This central dimension of the Iraqi COIN breakthrough, along with the additional 28,500 combat personnel associated with the surge operation, reshaped U.S. military thinking more profoundly than any other event since the Vietnam War. Thus the indirect way of war is in full tilt also in North Africa, the Horn of Africa, and the Philippines. American forces employed variants of surrogate warfare in their frontier battles in the Western plains, the Philippine insurrection, the Nicaraguan incursions, and the Vietnam War. But the Iraq War re-catalyzed interest in COIN techniques and the usage of host-country manpower. Despite the unique complexities of the Iraq surge, the U.S. Army and Marine Corps plan to rely on the indirect approach in Afghanistan (and beyond) by winning over the population to furnish recruits for Afghan security forces, to turn over information about the Taliban insurgents, and to bestow loyalty on a foreign-created and -sustained central government in Kabul. 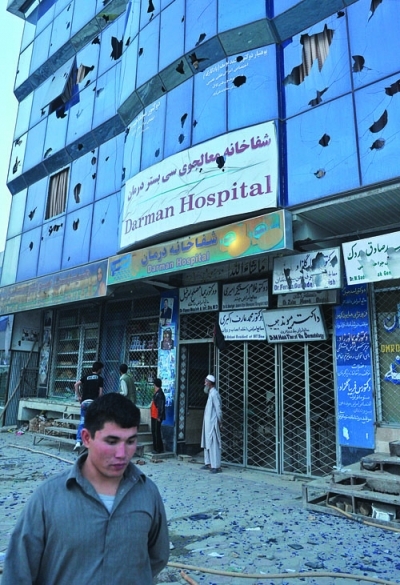 A Kabul hospital shows the effects of continuing violence in Afghanistan. U.S. military strategists reason that schoolhouses, wells, usable roads, and clinics will help win over the loyalty of indigenous peoples and ward off future terrorist attacks. Clausewitz’s writings have, for longer than a century, influenced generals to see the object of war as simply destruction of adversaries in detail. The Al-Qaeda network, the Taliban, and other radical adversaries fight fiercely against these American-led social re-engineering schemes for a globalized planet. Their backward-looking ideology espouses a violent separation from the outside world, not integration into it. In the middle live the bulk of the people, who wish a plague upon both houses so as to return to life before the conflict. Until recently, the indirect approach and indeed COIN warfare had lingered on the Pentagon sidelines. They were ostracized and demeaned in the windowed E-Ring offices of the top brass, who planned for the epic force-on-force battles of the twentieth century. High-intensity conventional warfare represented a familiar and comfortable choice for regular Army officers still swayed by the World War II experience. The journey to the upper rung of military thinking was long and arduous. Arguably, COIN’s nadir came during the Vietnam War, when, its exponents believe, it never received a fair hearing from the conventionally minded military chiefs despite ground-level breakthroughs. The mainstream generals, who wanted to fight the war in Southeast Asia with helicopter-borne mobility and formidable firepower, shunted it aside in favor of the conventional sweeps and heavy shelling of an elusive enemy. There is another type of war, new in intensity, ancient in origins—wars by guerrillas, subversion, insurgents, assassins; wars by ambush instead of by [conventional] combat. . . . It requires . . . a whole new kind of strategy, a wholly different kind of force, and therefore a new and wholly different kind of military training. This new strategy, force, and military training rose to front-rank importance during the initial phase of the Afghanistan intervention and then again after the stalemated Iraqi occupation of 2003–6. One recent, well-publicized example is the Army-Marine alliance with the Sunni Awakening Councils (Sons of Iraq) movement in early 2007 against extremists and the Iraqi branch of the Al-Qaeda network. Now the principles of COIN—winning the hearts and minds of populations under insurgent threat, gathering detailed intelligence on foes, wielding psychological carrots more than military sticks, and working through, with, and by non-U.S. partners—are accepted in the uppermost reaches of the Pentagon. “Success in the long term, more importantly, will be when the people of Afghanistan develop trust and faith in their own government and military,” said General McChrystal. The stakes for America’s COIN response are high and the risks cannot be ignored. While COIN tactics—especially allying with former insurgents—enabled the United States first to topple the Taliban regime in Afghanistan and then to turn the tide of the insurgency in central Iraq, the history of conducting antiguerrilla campaigns is fraught with complexities and unintended consequences. Culture, politics, and local conditions confound any rigid application, the creation of any template, to neutralizing insurgents. The indirect approach may be a necessity, but it cannot become a dogma. It must be applied with steely pragmatism. The Army’s official studies and the writings of military intellectuals are replete with miscalculation and even tragic error in planning for armed engagements. Lest any student of military history forget, the Vietnam War began for the United States as an advisory and partner-building operation with the South Vietnamese government and armed forces. Seeing its limited resources as doomed to fail, Washington escalated its commitment and backed into a multiyear, raging conflict that sapped the nation’s well being. cConditions within Afghanistan are currently quite different from those of central Iraq. Nor should a partnership strategy overreach by grafting a twenty-first-century American societal model onto lands struggling to clamber into the modern era. The indirect approach will always benefit from an appreciation of societal and operational distinctions. The vaunted Iraqi surge might be considered a ready-made model for Afghanistan, but in Iraq the indirect approach drew from several interrelated factors that are not yet present in Afghanistan. In central Iraq, the foreign-led Al-Qaeda affiliate violated cultural norms with its nearly indiscriminate violence, doctrinaire imposition of Islam, and finally targeting for assassination of Sunni tribal leaders when they opposed Abu Musab al-Zarqawi’s policies. 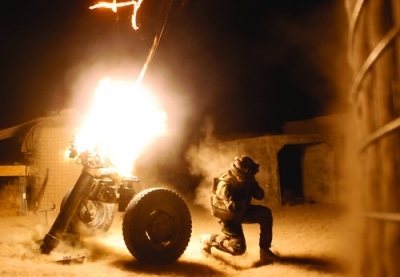 By the end of 2006, U.S. ground forces had begun to change the military balance on the ground in the cities of Fallujah and Ramadi, the provincial capital of Anbar. The arrival of additional combat troops early the next year gave the U.S. ground forces the upper hand. The U.S. reinforcements and better COIN tactics confronted the Sunni, who constituted only a fifth of Iraq’s population, with the prospect of defeat. Instead, their tribal militias, amply bankrolled with U.S. cash, joined with the coalition forces against Al-Qaeda. The United States was greatly favored by the turnaround of the Dulaimi Tribal Confederation within Anbar province in central Iraq. This large, cohesive tribal grouping laid the foundation of the “awakening,” bringing in other tribal entities. Conditions within Afghanistan are currently quite different from those of central Iraq. The Taliban observes most cultural taboos within the Pashtun community, the country’s largest ethnic group. The insurgents made a comeback in the early 2000s, thanks to the brutality and corruption of Kabul’s local officials. The Taliban responded to local concerns, instituted an elementary form of law and order, and so far have avoided the excesses of the Al-Qaeda in Iraq terrorist movement. Moreover, the Pashtuns deeply resent the Kabul government’s abuse of power, villainy, and pervasive corruption. Nor are there Afghan versions of the Sunni figures Abu Risha al-Sattar and the Dulaimi elders, who spread the “awakening” from tribe to tribe. The mountains and valleys of Afghanistan enforce territorial compartmentalization, making intertribal cooperation difficult among the fragmented tribes with their internecine and overlapping conflicts. The indirect approach may be a necessity, but it cannot become a dogma. It must be applied with steely pragmatism. At this juncture, U.S. and NATO forces are battling to establish sufficient security in the violent southeastern belt to enable leaders to line up their communities against the Taliban insurgents. Some notable breakthroughs have taken place. In early 2010, the Shinwari people—a subtribe of the Ghilzai tribal confederation—joined with the central government in its anti-Taliban campaign. Their cooperation marked a key realignment; it points toward other Ghilzai subtribes taking the same step. West of Kabul, in a less violent arena, the public protection programs (PPPs) have begun to marshal community self-defense units, known as Guardians, against the insurgents. The PPPs, begun in early 2009, will face a daunting environment in the Taliban-contested zones along the Pakistani border, across which the insurgents enjoy sanctuaries for recruitment, training, and regrouping. Backing and relying on tribal elements or village forces is a double-edged sword, it could be argued, because the policy cuts at cross purposes with the overarching goal of forging national institutions, such as multiethnic and merit-based police, army, and civil authority structures. Tribal arrangements, to this way of thinking, are anachronistic; they look to ancient customs and practices that have little to contribute to modern states dependent on central governments. But as a practical matter, tribes capture their members’ loyalty, administer rough justice, and control militias that can deal a blow to the Taliban and establish stability in the countryside. They represent innate, formed, and ready-to-use forces to wage anti-insurgency struggles. As in so many other examples, matching ends and means is the ongoing calculus of counterinsurgency. Excerpted from Afghanistan, Counterinsurgency, and the Indirect Approach, by Thomas H. Henriksen, a publication of the Joint Special Operations University (http://jsoupublic.socom.mil).